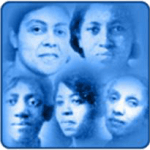 Zeta Phi Beta Sorority, Inc. under the leadership of International Grand President Lulellia Walker Harrison made its presence known in New Jersey, the Garden State, on March 25, 1948. The late Alexzina Brown was active in the African Methodist Episcopal Church in the Camden and Princeton Communities where she found five young women ready and willing to become members of this great sorority. At the Macedonia A.M.E. Church in Camden, New Jersey where her husband was the pastor, Alexzina Brown along with then Regional Director Evelyn Hunt and Esther C. Payton, chartered Gamma Nu Zeta Chapter with Catherine Johnson of Princeton, Evelyn Hines Ellerbee of Princeton, Jeanne E. Lewis of Millville, Katherine Basselieu Ross of Delaware, and Inez S. Brooks of Camden as its charter members in 1948. These enthusiastic members held chapter meetings at their churches throughout the state, spreading the work about Zeta. They had successful Finer Womanhood and Founders’ Day programs at which Zeta founder, Arizona Cleaver Stemons was often in attendance. In 1952, the chapter hosted one of the early regional conferences which was held in the Kaighn Avenue Baptist Church auditorium, where more than 200 members converged upon the state. At that time, there weren’t any hotels which would accommodate blacks, therefore delegates were housed in the homes of members and friends.